Wily West Productions are specialists in original theatre written and produced locally and featuring local talent. Followers of TheatreStorm will be aware of their rapidly expanding reach as evidenced by their participation this year in Scheherazade 13, the Bay One Acts Festival and two previous world premieres, “Gorgeous Hussy” and “Lawfully Wedded” all of which opened to enthusiastic reviews. The spook play has a long theatrical tradition. Shakespeare, of course, is full of ghosts, from Hamlet’s father to the vengeful Banquo of the Scottish Play (DON’T say it aloud, especially in October! ), to Julius Caesar. James M. Barrie authored the classic “Mary Rose” (shortly to be revised in a new adaptation, “The Disappearance of Mary Rosemary” by Second Wind Productions). The longest running play in London is “The Woman In Black”, a delicious theatrical ghost story recently revived at The Douglas Morrisson Theatre in Hayward. 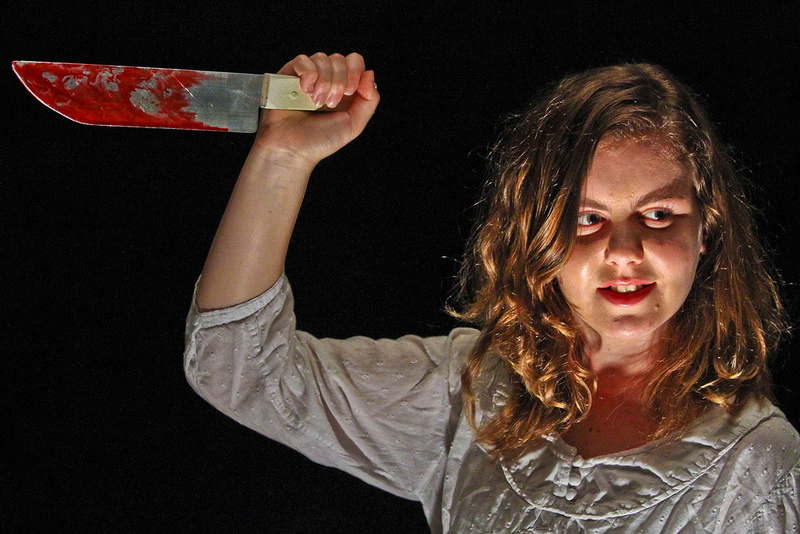 And then, of course, if you aren’t scared enough already, there is Carrie: The Musical brought to us by Ray Of Light Theatre. All of which is to say we love us some ghosties. For Wily West, playwright Rod McFadden promises to deliver a classic spine tingler full of romance and mystery, with horrifying children, dripping blood, nightmares, a mysterious cottage, a dark secret, a peculiar landlady and everything else that makes for Halloween joy. On top of all that, he plans to make us laugh! But who, we ask, will laugh last? Who, indeed? “Hope’s Last Chance” will feature a star turn by local teenager Ella Zalon in her first professional production. Ella reports that she has never seen a ghost, but she’d like to. We’d say that in the dark corridors of The Exit Theatre, her chances are pretty good. McFadden is well equipped to take on the challenge of writing in the difficult ghostly genre. In 2012, he won a People’s Choice award at the inspiraTO Fesitval in Toronto, and has had successful productions at theatres all over the United States. 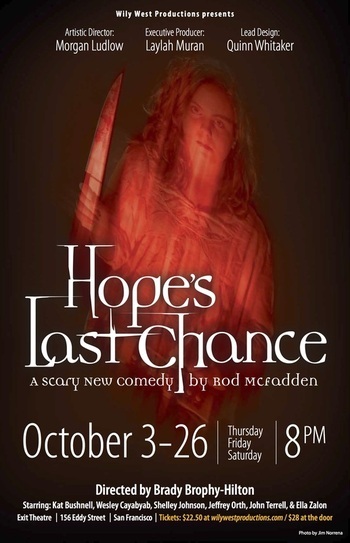 “Hope’s Last Chance” is his second full-length play. “Hope’s Last Chance” is directed by Brady Brophy-Hilton, fresh off her success with “Gorgeous Hussy”. Brophy-Hilton’s fingerprints are all over the Bay area theatre scene, from Sleepwalker’s Theatre to the late lamented Teatro Zinzanni to PianoFight. Kat Bushnell and Wes Cayabayab in “Hope’s Last Chance”. Photo Credit: Jim Norrena. Wily West Productions was founded in 2008 with the specific mission of producing new plays by Bay Area playwrights, using local talent for all aspects of their productions. As their reputation has grown, however, more and more playwrights have contributed work. Today, there are approximately 100 theatre artists associated in one way or another with Wily West, including nearly two dozen playwrights whose work has been promoted by the company. Many of these playwrights enjoy growing national reputations and have won prestigious awards. Posted in Reviews.Tagged Bay One Acts Festival, Carrie: The Musical, Charles Kruger, Douglas Morrisson Theatre, Ella Zalon, Gorgeous Hussy, Hope's Last Chance, Kat Bushnell, Lawfully Wedded, Mary Rose, Ray of Light Theatre, Rod McFadden, san francisco theatre, Scheherazade 13, Second Wind Productionss, The Disappearance of Mary Rosemary, The Exit Theatre, The Woman In Black, theatrestorm, Wes Cayabayab, Wily West Productions.